Space Mining, Artificial Intelligence and Transition? Posted byDr Jean-Michel Valantin (PhD Paris) March 19, 2018 March 19, 2018 Leave a comment on Space Mining, Artificial Intelligence and Transition? Is space mining the short and long-term future for energy and industry? Nowadays, this question is rooted in the rapid development of the industrial, financial, technological and legal apparatus around the idea of mining asteroids. For example, on 6 January 2015, the US President, then Barack Obama, signed the US commercial space launch competitiveness act. This act aims at “spurring private aerospace competitiveness and entrepreneurship” (US Commercial Space Launch Competitiveness Act). It allows US citizens to “engage in the commercial exploration and exploitation of “space resources””, including water and minerals. In other terms, this law obviates the 1967 international space law treaty based on the principle of non-appropriation of space bodies. Thus it makes possible to develop private industrial ventures in deep space, through the right of appropriation of the resources that can be found there (K.G. Orphanides, “American companies could soon mine asteroids for profit“, Wired.com, 2015)”. It must be noted that, since the beginning of the second decade of this century, the mining of resources in space has become a growing industrial project, through the creation of asteroid mining companies, which attract billion of dollars in funding (Helene Lavoix, “Beyond fear of near-Earth objects: mining resources from space?”, The Red (Team) Analysis Society, February 18, 2013). In the same time, the space mining idea is spreading at the international level. It is of interest to the West private sector as well as for, for example, to the Chinese and Emirati state sector (Jean-Michel Valantin, “The UAE Grand strategy for the future – from Earth to space”, The Red (Team) Analysis Society, July 4, 2016). The attraction exerted on the mining sector by the concept of asteroid mining is itself driven by the international competition for mineral resources, being progressively depleted (Michael Klare, The Race for What’s Left, 2012). The international movement of energy transition towards more sustainable forms of electricity production necessitates huge amounts of these rare enough minerals (reference?. Furthermore, the current industrial and economic worldwide growth demands more and more minerals, especially in the exponentially growing digital sector. In other terms, space mining could be the basis of the Earth international energy transition and industrial sustainability (David S. Abraham, The elements of power, gadgets, guns, and the struggle for a sustainable future in the rare metal age, 2015). However, it is necessary for this industrial space revolution to integrate the new capabilities emerging from the artificial intelligence and robotics current revolution: only autonomous robots can accomplish the extremely dangerous and heavy work necessitated for asteroid mining. Building upon Helene Lavoix seminal article which identified the issue first and put it on the Red (Team) Analysis Society, the first article of this series will look at the drivers of the “space mining” race, from a space industry point of view. It will point out that the new imperatives emerging from the energy transition and the digital revolution is one of the considerable forces behind space mining. Then, we shall look at the new risk and opportunities arising from space mining. On 19 July 2015, the asteroid 2011 UW 158 passed closed by Earth at 1.5 million kilometres away. It was identified as an “X type” asteroid, i.e. a metallic object. According to the Sloosh Community Observatory, this asteroid could be packed with 90 million tons of precious metals, among them platinum. This means that this asteroid contains more platinum than has ever been mined during human history and could have a 300 billion to 5.4 trillion dollars net worth and while this quantity of metal is not injected in the current commodity market (Robert Hackett, “Asteroid passing close to Earth could contain $5.4 trillion of precious metal”, Fortune, July 20, 2015). It must be noted that Planetary Resources has identified this asteroid as being potentially “suitable for mining” (Eric Mack, “Trillion dollar baby” has wanabee space miners salivating”, Forbes, July 19, 2015). The industrial interest that is so expressed for asteroids is rooted into the new race for minerals, especially the famous “rare earths” generated by the exponential growth of electronic and internet technologies, as well as by the current energy transition towards an expanded energy mix (Guillaume Pitron, La guerre des métaux rares, la face cache de la transition énergétique et numérique, 2018). The rapid and massive development of energy transition, in particular through the rapid growth of photovoltaic industries, especially in Asia, besides the related industrial efforts made by countries like China, India, the United Arab Emirates, Morocco, Norway, numerous states of the United States, among many others, necessitates huge and growing amounts of those precious minerals (Jean-Michel Valantin, “The United Arab Emirates, The Rise of an industrial sustainable industrial empire”, The Red (Team) Analysis Society, June 13 2016 and David S. Abraham, ibid). The current energy transition is such that in 2040 more than 25% of the global energy production could be produced by the renewable energy sector (Michael Klare, “Go Green young man, young woman”, TomDispatch, Decembre 13, 2015). The combination of digital growth and energy transition is creating a worldwide system of need for minerals, knowing that the number of terrestrial deposits is limited, even if all of those are not yet exploited. This tension between the perpetually growing and developing humanity and the Earth’s limited resources creates an “international mineral need” that is an economic and political power in itself. In effect, this “need for minerals” is felt as well by countries as by public and private companies, and is driving the development of the whole digital and cyber sector, as well as the aerospace and defence sector and all that activities that depend of it. This convergence of “mineral needs” creates an international nexus of needs and thus a “global need” for minerals that powers the race for mining as well as it drives the political and economic decision that it entails. New actors are emerging in order to answer this need and thus harness its power. Those actors are leading a deep and rapid transformation of the space sector and of the mining sector, notable through the combination of the two. On the space sector side, a revolution is currently happening in the launching and transport capabilities fields (Monica Grady, “Private companies are launching a new space-here is what to expect”, The Conversation, October 3, 2017). 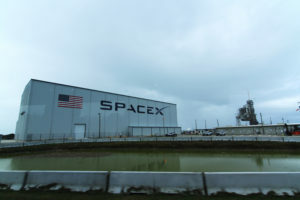 We witness notably the rapid development of the Chinese public sector combined with the expansion of the Chinese space program, while in the U.S. the evolution takes place not only in the public sector but also in the private space sector, as evidenced by the new Space X created by Elon Musk and Blue Origin, created by arch-billionnaire Jeff Bezos. On the U.S. public side, the NASA, the historic U.S. space agency, is very active to be present in the space-mining field (Karla Lant, “NASA is fast-tracking plans to explore a metal asteroid worth $ 10 000 quadrillion”, Futurism, May 28, 2017). In the same dynamic, the NASA, is already preparing the Psyche mission that will be composed of the launching of an orbiter satellite around the metal asteroid 16 Psyche, in order to study its composition (Brid Aine-Parnell, “NASA Will Reach Unique Metal Asteroid Worth $10,000 Quadrillion Four Years Early », Forbes, 26 May 2017). The iron and nickel payload of this asteroid could be up to 10 000 quadrillion dollars. If these numbers are primarily a way to express the potential economic interest of asteroids, they also exemplify how the space sector, as well as the solar system is becoming a new kind of industrial attractor. For example, the asteroid belt between Mars and Jupiter is composed of hundreds of thousands of asteroids of multiple sizes (Matt Williams, “What is the asteroid belt?“, Universe Today, 23 August, 2015). More than 200 of these are already identified as being potentially exploitable (Suzanne Barton and Hanna Recht, “The massive prize luring miners to the stars”, Bloomberg, 2018). The NASA already targets the Bennu asteroid in order to send a mission to grab some samples of its surface. Thus, the mission will accomplish both a fundamental scientific goal about the understanding of the origins of our solar system and driving the development of the robotics necessitated for asteroid operations (Barton and Recht, ibid). Towards “intelligent space-mining” and entrepreneurship? 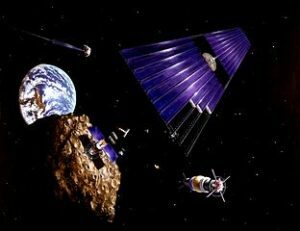 This dynamic towards space mining has driven the creation of companies that are aiming at exploiting asteroids, mainly Planetary Resources-The Asteroid mining company and Deep Space industries (Helene Lavoix, “Beyond fear of near-Earth objects: mining resources from space?”, The Red (Team) Analysis Society, February 18, 2013). These companies are developing space-mining-based business models for mining the Moon, Mars and the deep space asteroid belt between Mars and Jupiter. This is creating a technological nexus where the different industrial revolutions taking currently place i.e. the artificial intelligence and the robotic revolution potentially meet mining. Artificial intelligence is currently being integrated to the mining industry, through the use of autonomous robots and a rapid enhancement of captors that allow robots, workers, artificial intelligence and analysts to better analyse the state of their working environment and to optimize extraction and safety (John Walker, “AI in mining – mineral exploration, autonomous drilling, and more”, Tech emergence, December 3, 2017). Some are already calling this trend “intelligent mining” (John Walker, ibid). 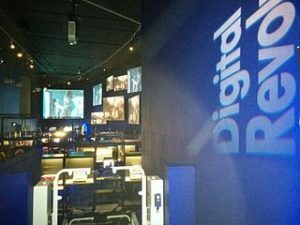 This evolution of the mining industry is led, for example, by partnerships of artificial intelligence companies as NVIDIA, and IBM and mining companies as Komatsu (Kevin Krewell, “NVIDIA and Komatsu partner on AI-based intelligent equipment for improved safety and efficiency”, Forbes, December 12, 2017). In the same time, China develops its public space program that aims at installing an autonomous robot base on the Moon, and integrates artificial intelligence development to its space program. The Russian Foundation for advanced studies is developing a robot able to intervene in extreme environments, such as space, while developing a very close space partnership with China (jean-Michel Valantin, “Jean-Michel Valantin, “The Chinese-Russian Robot and Space cooperation – China (1) and « Russia » (2)”, The Red (Team) Analysis Society, January 8, 2018). This dynamic also attracts investors, such as the American high-tech multi-billionaires Jeff Bezos, Elon Musk, and Peter Thiel, as we already saw, as well as countries, such as Luxemburg or the United Arab Emirates, i.e. investors and countries with a massive financial leverage capability (Clive Cookson, “Luxemburg boldly goes into asteroid mining”, Financial Times, May 5, 2016). This financial dimension expresses the way investors may consider space mining as having a massive potential for return on investment. It must also be kept in mind that space ventures being dramatically costly and hazardous, the commitment of the financial community is in itself vital, besides being a powerful signal of interest. These new public and private capabilities are currently being gathered. It must now be seen how these new industrial and financial actors could lead to a displacement of an important part of the world economy towards space. 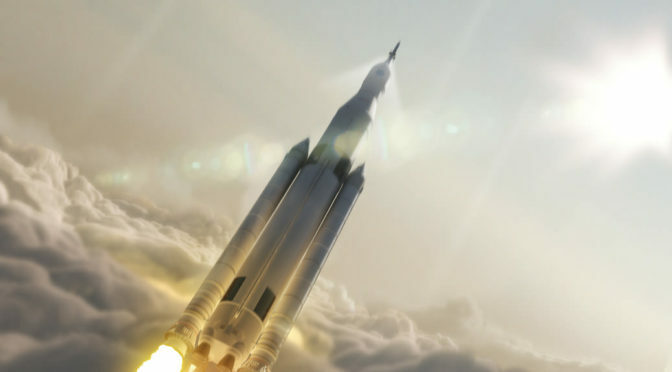 Featured image: Artist’s impression of NASA’s Space Launch System (SLS) 70-metric-ton configuration launching to space. – 2014 – NASA – Public Domain via Wikimedia.